On Saturday 28th October 2017 some island men visited the Caves to take supplies and do some work on their huts. When they where over there they spotted a mother ewe with two lambs. 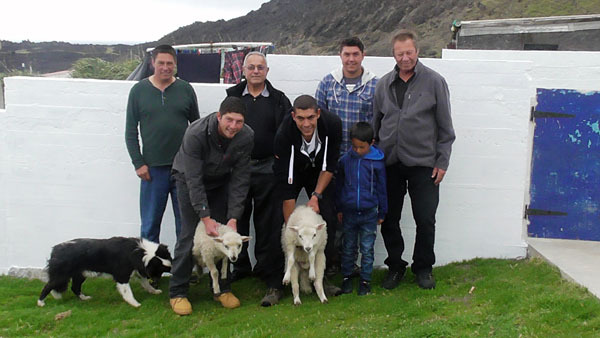 This is the first time ever known by the islanders that sheep have been seen at the Caves. The mother ran away but the two lambs where brought back by boat. They are now out grazing at the Patches. Back row left to right- Martin Green, Joe Green, Jason Green and Neil Swain. Front row right to left Steve Swain, Shane Green and Lucas Swain. Sheep graze the Settlement Plain and often at Anshorstock and Sandy Point, as well as on the mountain. It is possible that this group of sheep found their way down the Gipsy Ridge path from the base to the Caves.